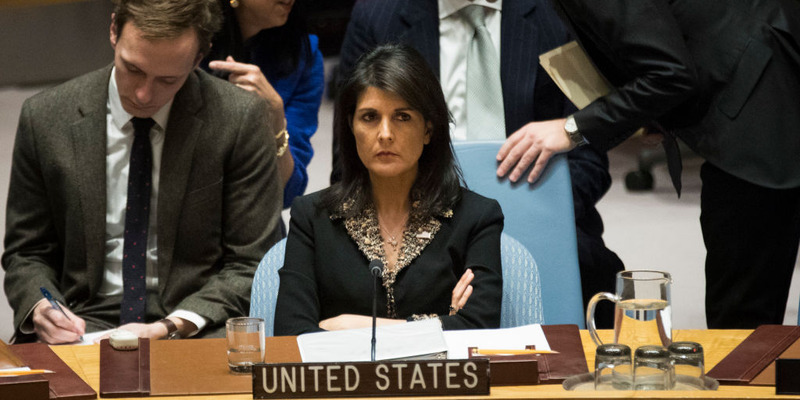 Drew Angerer/Getty ImagesUS ambassador to the United Nations Nikki Haley listens during a Security Council meeting concerning the situation in the Middle East involving Israel and Palestine, at United Nations headquarters, December 18, 2017 in New York City. The United Nations overwhelmingly voted in favour of a resolution condemning Israel for using “excessive, disproportionate and indiscriminate” force in response to intensified clashes along the Gaza border. Clashes along Israel’s border with Gaza have reached boiling point in recent months following US recognition of Jerusalem as Israel’s capital. Gaza’s Ministry of Health said that 123 Palestinians have been killed and almost 14,000 have been wounded by Israeli forces since protests began in March. The United Nations overwhelmingly voted in favour of a resolution on Wednesday condemning Israel for using “excessive, disproportionate and indiscriminate” force in Gaza following several fatal clashes along Israel’s border in recent weeks. The resolution stated it “deplores the use of any excessive, disproportionate and indiscriminate force by the Israeli forces against Palestinian civilians in the Occupied Palestinian Territory, including East Jerusalem, and particularly in the Gaza Strip,” citing Israel’s use of live ammunition against protesters and the deaths of a journalist and medical personnel. The resolution condemned the “firing of rockets from the Gaza Strip against Israeli civilian areas,” which have increased following clashes, and requested the UN secretary general submit a written response regarding the safety of the Palestinian civilian population. Prior to the vote, the US attempted to add an amendment to the bill denouncing Palestinian political and militant group Hamas for its part in stoking violence between Israelis and Palestinians. 62 countries voted in favour of the amendment and only 58 voted against it, but the amendment was shot down for failing to reach a two thirds majority. “The nature of this resolution clearly demonstrates that politics is driving the day. It is totally one-sided. 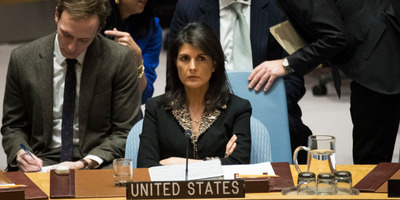 It makes not one mention of the Hamas terrorists who routinely initiate the violence in Gaza,” Haley told the General Assembly before the vote. Clashes along Israel’s border with Gaza have escalated significantly in recent months, following US recognition of Jerusalem as Israel’s capital which infuriated Palestinians, who share claims to the city. Tens of thousands of protesters gathered for what was referred to as the “Great March of Return” which began March 30 and continued through May. Protests intensified in the weeks following the US embassy move to Jerusalem, culminating in a massive protest on May 14 which left 60 dead and more than 2700 injured.